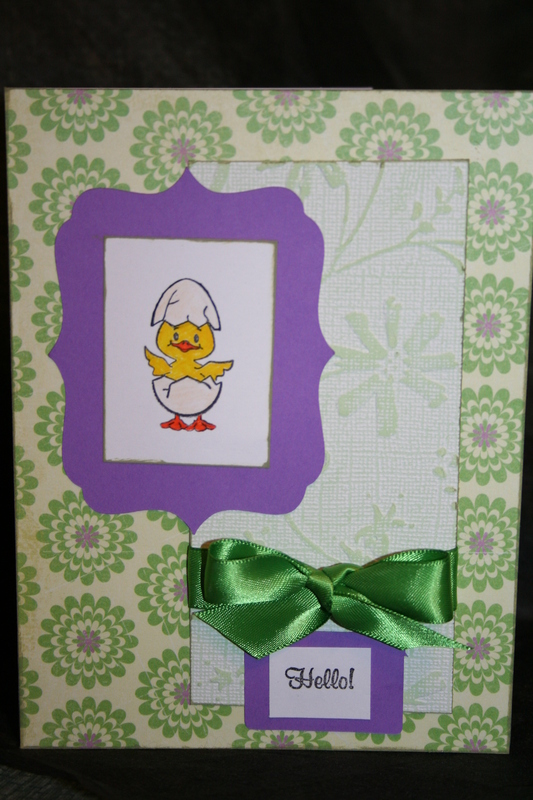 So I couldn’t sleep the other night and got up at 2:30am and decided to make an Easter Card. 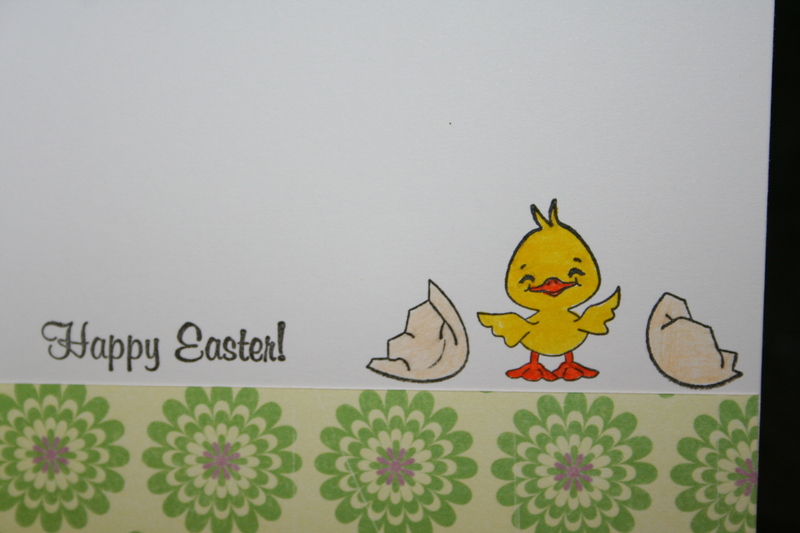 I really enjoyed playing with Peachy Keen Spring Stamp mini’s the other day so I decided to use them again. 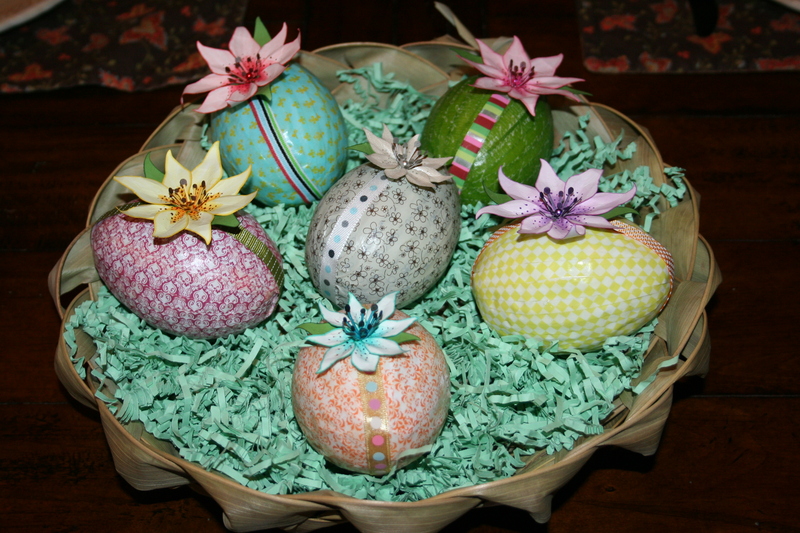 I used paper from Nana’s Kitchen. I cut it so I had the different patterns aligned the way I wanted. 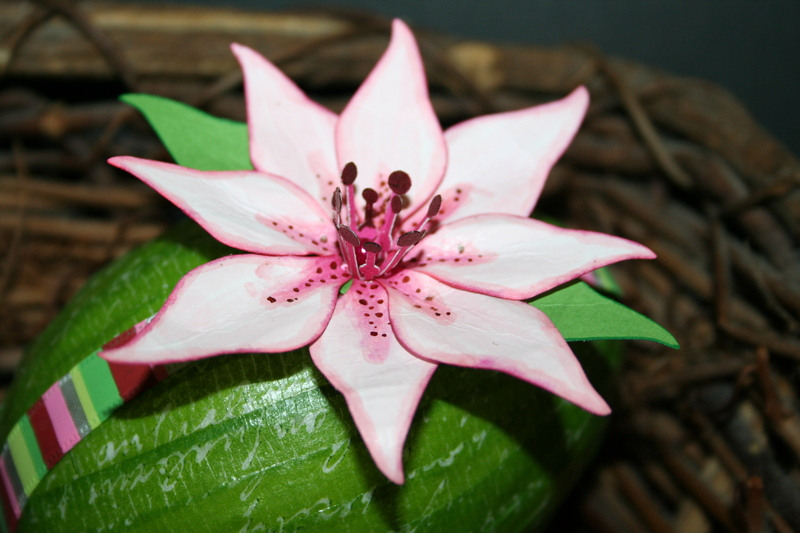 I cut one section 10″ x 3.5″. 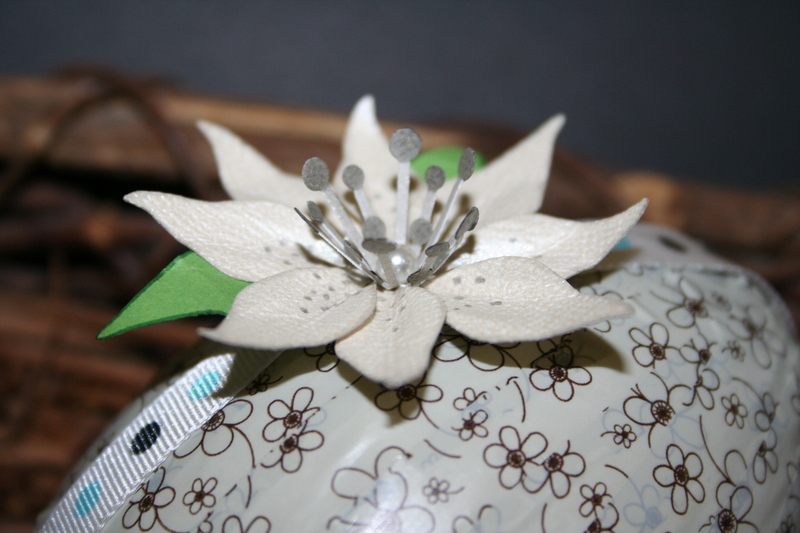 The second section was 5″ wide and 5.5″ tall and I had to cut out a 2.5″ x 2″ section out of the right side of the top. 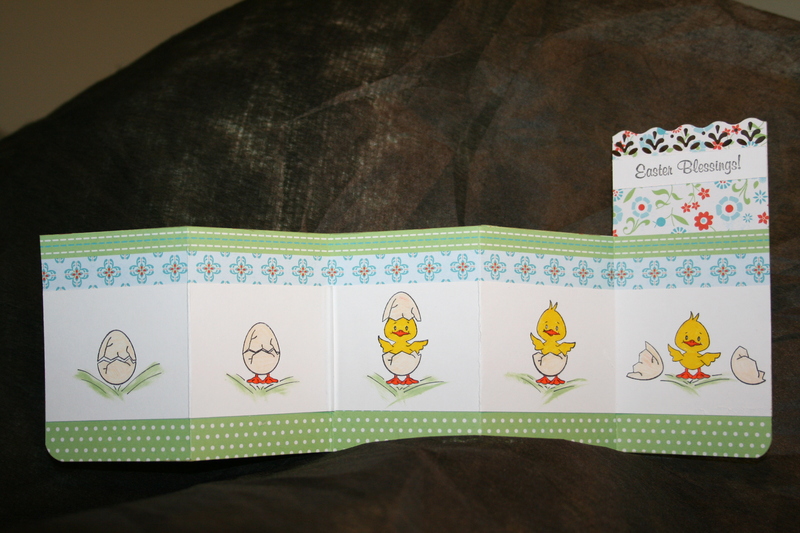 It required piecing together the paper to make the card the right length. 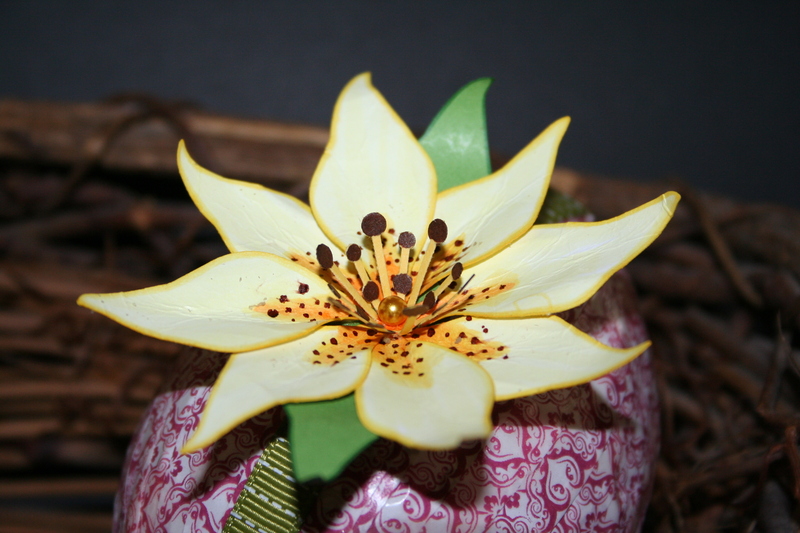 I scored the paper horizontally at 2.5″, 5″ and 7.5″ on the first piece and at 2.5″ and 5″ on the second. 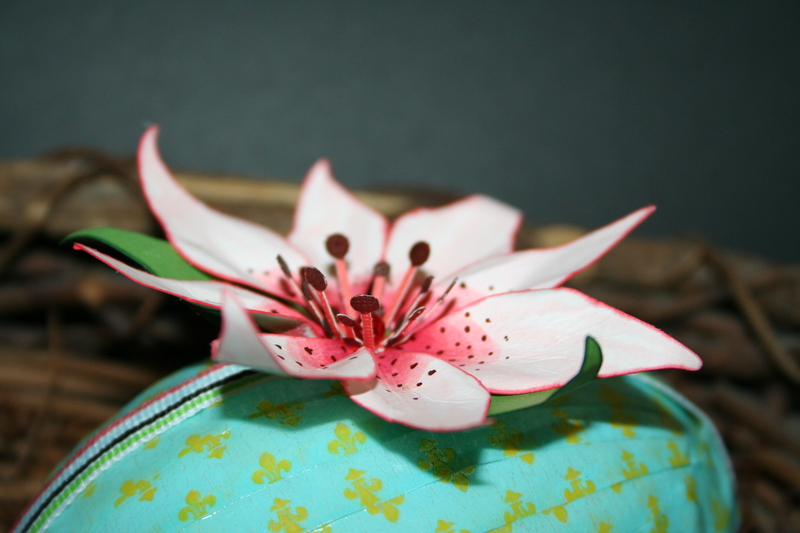 Then accordian folded the paper and overlapped the last fold of the fist paper with the first fold of the second paper and adheared it together. 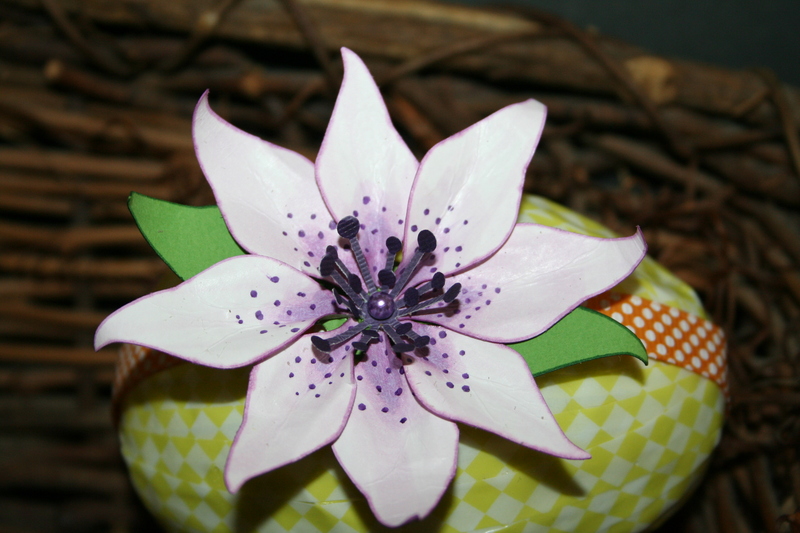 Next, I added a 2.5″ tall piece of white paper onto the patterned paper. 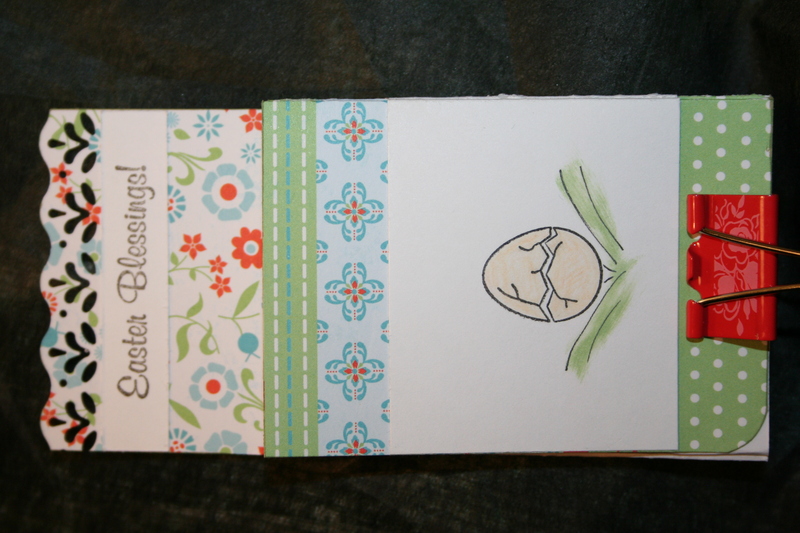 I used Martha Stewart Botanical punch along the top edge of the back of the card. 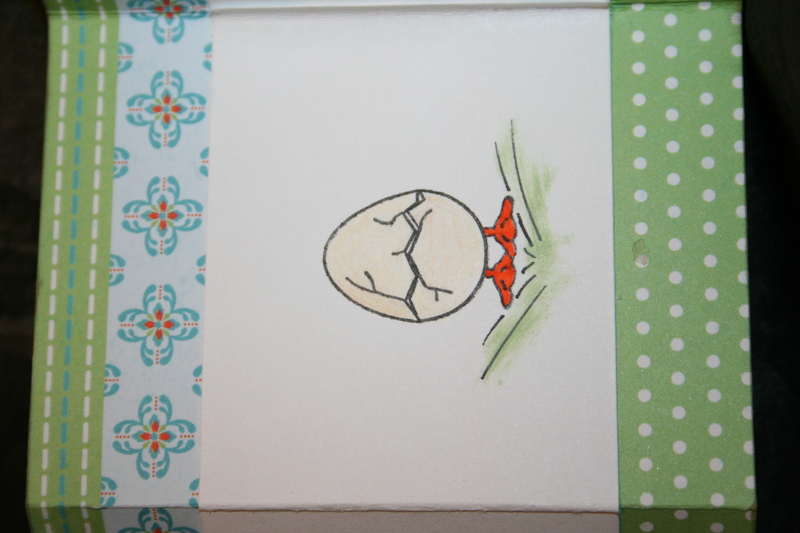 I inked sections of the chick and egg stamps and layered them together to form the images on the card. Thanks for all your nice commets and feedback. Ordered several stamps from Peachy Keem Stamps on St. Patrick’s Day (and won one of their gift certificates in the drawing! 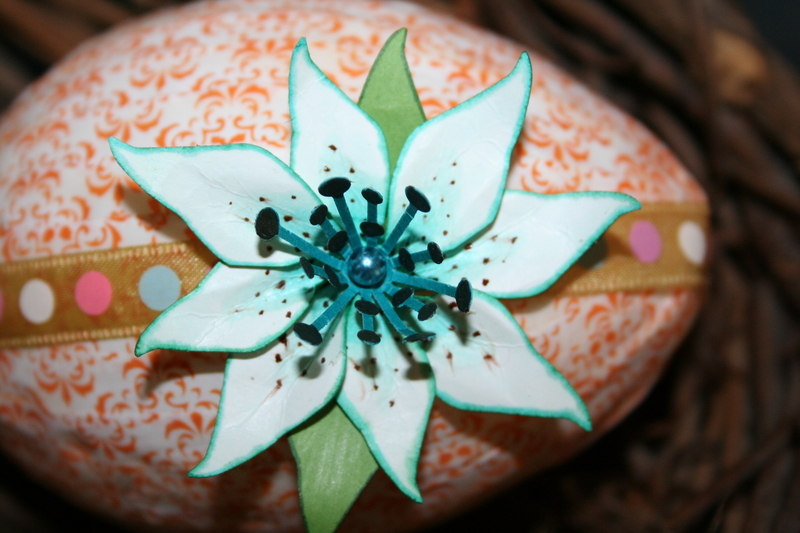 ), one of which was the Easter mini’s. What can I say…Love it! I had so much fun mixing and matching these stamps together! 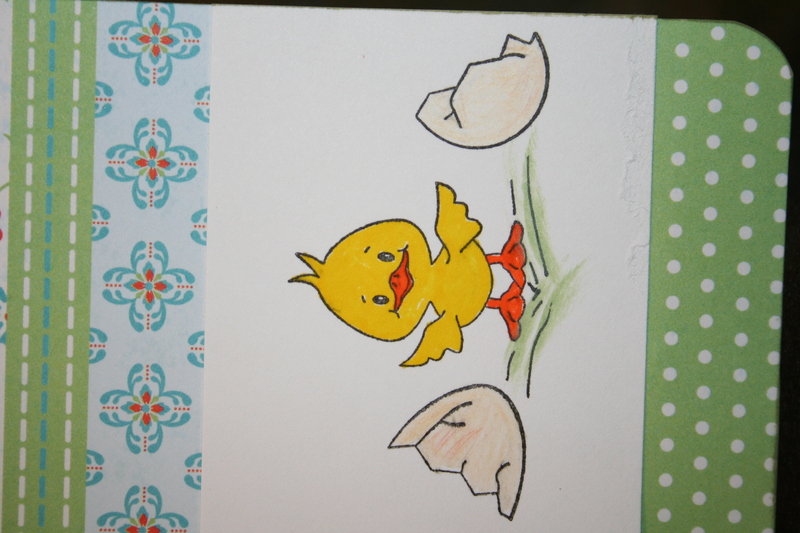 I thought those little chicks had a “just hatched” look so I carefully pieced the broken egg and chick together to get the image on the front of the card. 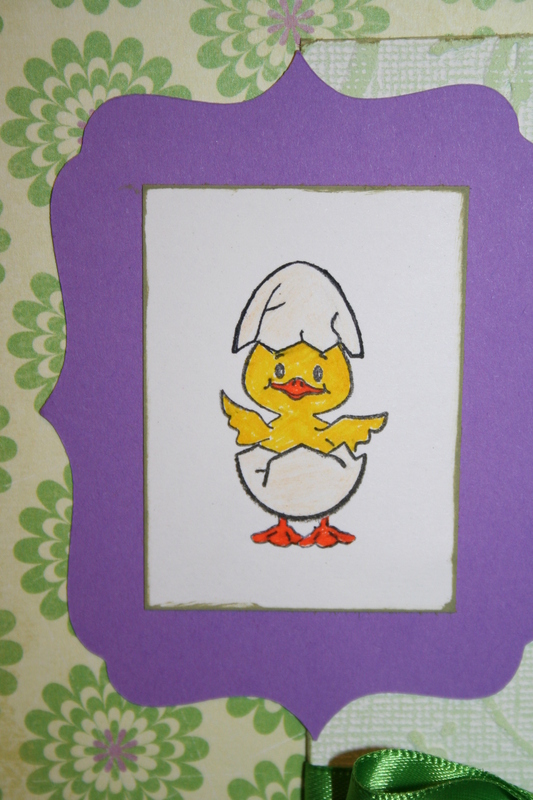 Since the chick just entered the world I thought “Hello!” was a perfect sentiment to pair with it. 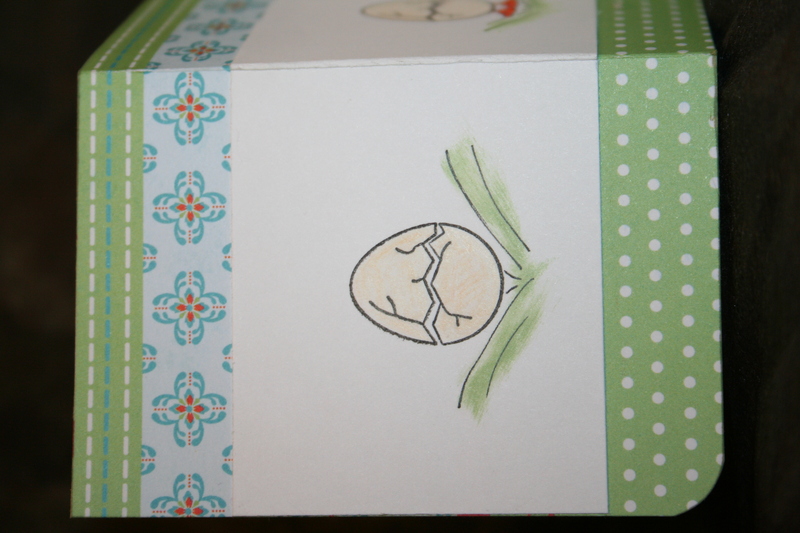 Since I enjoyed doing the outside so much I continued the hatching theme inside the card as well. I cuttlebugged the vertical rectangle (Co’ordinations paper) on the front of the card and sanded it to bring out the green color underneath, then inked the edges in green as well. 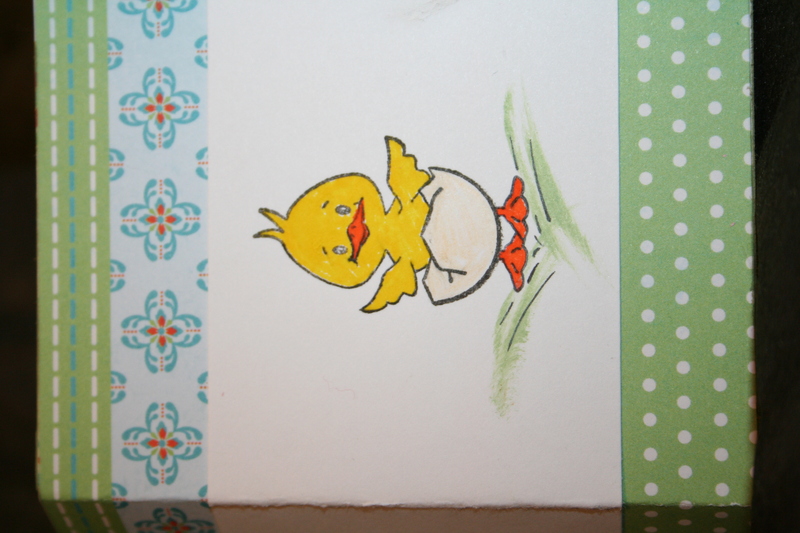 I also inked the edges of the main card and around the chick as well. 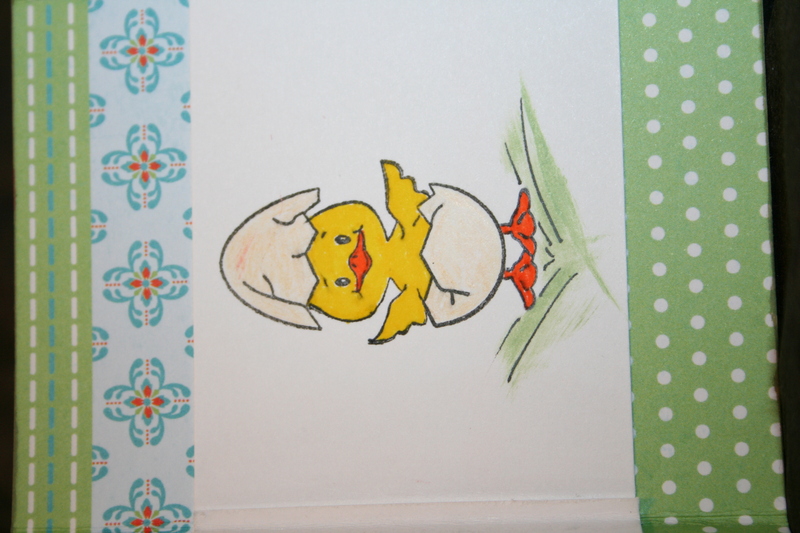 The frame around the chick was cut using the Heritage cartridge. Thanks for your nice comments and feedback!